Mississauga, Ont., August 29, 2012–—PROFIT Magazine today ranked Nexus Systems Group NO. 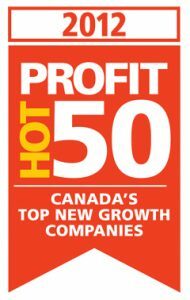 29 on its 13th annual PROFIT HOT 50, the definitive ranking of Canada’s Top New Growth Companies. For the past two years alone, Nexus has experienced consistent growth and currently serves numerous major clients in the financial, insurance, government, telecommunications and retail industries in North America. With the help of its dedicated expert staff, Nexus shows no signs of slowing down and anticipates that it will only continue to expand in the future. PROFIT Magazine is your guide to Business Success is Canada’s preeminent publication dedicated to the management issues and opportunities facing small ad mid-sized businesses. For 30 years, Canadian entrepreneurs and senior managers across a vast array of economic sectors have remained loyal to PROFIT because it’s a timely and reliable source of actionable information that helps them achieve business success and get the recognition they deserve for generating positive economic and social change. Visit PROFIT online at www.PROFITguide.com.